Vulgaris had the pleasure to interview Sergei Sviatchenko, a Ukrainian-born collager, photographer, painter, filmmaker, and fashion designer who now calls Denmark his home. 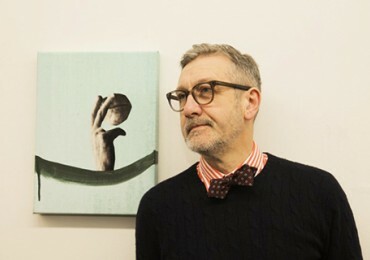 A provocateur in the world of contemporary art, Sviatchenko’s collages and paintings have been exhibited in Denmark, Austria, Germany, Italy, France, England, Canada, and the United States, and featured in magazines like Dazed & Confused, AnOther, Kilimanjaro, Varoom, Elephant, This is a magazine, Rojo, Viewpoint and Blueprint. Sviatchenko brought his unique, disruptive vision to every piece, field, and publication over the course of his impressive career. Join our conversation to get a sense of the icon’s early motivations, artistic impulses, professional habits, and contemporary influences. The text of the interview has been edited for clarity and flow. You were born in Ukraine, and spent the first half of your life there before moving to Denmark in 1990. Does the shadow of Soviet cultural and cognitive limitations still influence your work? Do you see remnants of your upbringing in your art? Sergei Sviatchenko: The limitations sometimes were good for creativity. Like a challenge. And yes, remnants of my upbringing are rather good cultural education, probably one-sided but still good. My generation was free from Stalinist dictatorship, and the period of Brezhnev stagnation did not interfere with the life of individual. And then perestroika [Mikhail Gorbachev’s policy restructuring the command economy for greater openness] came. What motivated you to leave your homeland, and why did you choose Denmark? Sviatchenko: I had been very inspired by the cultural freedom following perestroika in the then-Soviet Union. I was one of the founders of the Center of Modern Arts in Kiev and curator of many exhibitions of modern Ukrainian art, including retrospectives together with emerging artists. Some of the exhibitions were shown in Denmark as a part of cultural exchange and in 1990 I got a grant at one of the art schools there to work and teach. This was the reason for the move, but later I got in touch with the art scene in Denmark and stayed. Now it is my country too. What is your process of creating a piece? Sviatchenko: When I make collage, I put music on, sit down, take my favorite Japanese scissors and start. It is not work – it is a moment of life that I enjoy. It is never a struggle. Somehow, what goes away and what stays is an easy choice for me. It is never an easy choice in other circumstances. I can make collage anywhere. Last time I did it when my grandchild was around and he became calm and sleepy – his parents were amazed. When I’m painting, I put music on, take my clothes off, and put on a working kit. Yes, it is work. The sight of the large surface of a white canvas puts me into constant struggle. Is it finished, is it me, is it what I wanted to do? You have a large collection of past works. Did you notice an evolution in interest or focus over time? Sviatchenko: In the earlier 80’s my audience was intellectuals in the Soviet Union. In Denmark in the 90’s my works were rather unusual for the audience, brought up on the art of the CoBrA movement. With internet popularisation the audience become broader. I noticed that you reuse some elements in different pieces – do you maintain a library? Sviatchenko: Yes, I do archive my images and photographs. Do you approach each work discretely, or do you find a set of common themes across series, mediums, or time periods? Sviatchenko: I work with series, but only a few left “live”. Sometimes I try to come back to a particular series, but it is never as good as I thought it would be. Shifting between mediums keeps me working. Commissions also give a nice challenge and a lot of different works in my portfolio result. Most of your professional work is painting or collage. Even your photographs remind of collage, with large blocks of colour and obtrusive elements that distract from or break up the form of the subject. Is there something specific that attracts your camera? Sviatchenko: I look for the same in photography: something unclear, something cut out of the context. Are the messages you can send with your collages constrained by changing styles in photography or painting or graphic design? Sviatchenko: I haven’t noticed this, because in practice I use images from different periods of time (sometimes they are from a previous century) and I connect them with my own photography and theory. My personal artistic choices during the creative process are built on subconscious, associative and impulsive thinking, drawing inspiration in the depths of our shared memory, with the aim of achieving “aesthetic surprise”. Filmmaker Andrei Tarkovsky said “All art, of course, is intellectual, but for me, all the arts, and cinema even more so, must above all be emotional and act upon the heart.” You made an homage to Tarkovsky with Noriko Okaku, a film of moving images, called Mirror by Mirror. It didn’t feel like a work that requested intellectual assessment. It seemed more to act as a portal to emotional experience. For me, it was like passing a Sunday with my family in the living room of my childhood house. Do you generally aim for emotive rather than intellectual appeal? And what is your affiliation with Andrei Tarkovsky? Sviatchenko: Oh, thank you for the right word. Affiliation, this is how I feel: connected. I think I learned of him before I was able to appreciate his genius. And this is what probably happened with a lot of other people. I love your example with Sunday in your childhood. We are all from there. It is probably the only common thing for all people. Later we learn and study, but we lose the ability to “act upon the heart.” Is it pity? No. Because there are plenty of people who don’t. Otherwise we wouldn’t have this dialog. It is only emotional value I aim for, but it doesn’t mean I do not appreciate the intellectual value in life. It is just the way for me to live – be emotive. How do you feel about Tarkovsky’s assertion that photographs are too beautiful to be a realistic depiction of life? Do you agree with his assumption that art should be realistic and/or reflect life? Sviatchenko: My affiliation to Andrei Tarkovsky is emotional. I haven’t studied him; I took him as I took his films. Look at his polaroids in the book “Instant Light”. They are more than beautiful and reflect life. I saw his polaroids, and they are gorgeous, but they are reflections of his life. On the other hand, few of your works are pretty, precisely because you use ugly forms and unnaturally mash together objects to create unexpected shapes and textures from familiar components. What would you say to a person who thinks art should be realistic, in order to be useful to us? Sviatchenko: How realistic is a rainbow, or a shadow? Or a melting ice cube? Are those observations useful to us? Similarly, Tarkovsky believed that colour in films detracts from cinema by unduly demanding attention. You respected this notion in Mirror by Mirror. Does that philosophy find its way into your other work? Sviatchenko: Very much so. I work with black and white images consciously, to leave some “beauty” aside. Similar in painting I use “ugly” colors or shapes in order to underline the beauty of imperfections. Sorry, sounds a bit banal, but this is how I feel. Collage seems to be your preferred method of approaching many artistic forms. Even your CLOSE UP AND PRIVATE fashion kit for Jack Jones was like collage by “pulling together considered elements that work alone and together.” What do you find universally appealing about collage? Sviatchenko: Its erroneous lightness. Its similarity with life – as a kaleidoscopic tube – when one thing changes everything changes, forever. Its democratic access for anyone. Its possibility to create new stories. CLOSE UP AND PRIVATE espouses a preppy style that you call classic. Do you have strong opinions about other styles? Sviatchenko: CUAP is an on-going project which looks to capture the spirit of modern style, as seen through the subtle shades of the individual. Through these details a complex discourse between clothing, fashion and image takes form, offering new perspectives on contemporary fashion and identity. This is what CUAP is about. The others call it preppy. Rick Poynor, who edited a recent publication of yours, wrote a feature on your work that quoted Stezaker: “Collage, the artist John Stezaker suggests, may be ‘a yearning for a lost world’ that reflects a universal sense of loss, yet the medium is ‘not about an imaginary retrieval of the past but about the impossibility of return: a condition of exile.’” How do you feel about that? Sviatchenko: I love what Rick Poynor did. His work is much appreciated. I agree with “impossibility of return” literally and metaphorically. You use many of the same models for CUAP. Who are they? Sviatchenko: My kids: twins Erik and Alexandra (ages 26). We began when they were 17 or 18. And sometimes their very serious older brother, Philip (29), or my old friend Alfred (93), or Erik’s dog Muffi. We had a hard time choosing from among Sergei Sviatchenko’s works to feature. If you are as enchanted with this artist’s vision and flair as we are, take a moment to visit his website. If you are in the area, he also runs an open studio space in Viborg, Denmark.